Miles Davis (trumpet) with ( tracks 1 to 4) Kai Winding (trombone) Junior Collins ( French horn) Bill Barber (tuba) Lee Konitz ( alto sax) Gerry Mulligan (baritone sax) Al Haig (piano) Joe Shulman (bass) Max Roach (drums) recorded New York, Jan. 21st 1949. (tracks 5 to 8) J.J. Johnson (trombone) Sandy Sieglestein (French horn) Bill Barber (tuba) Lee Konitz (alto sax) Gerry Mulligan (baritone sax) John Lewis (piano) Nelson Boyd (bass) Kenny Clarke (drums) Recorded New York, April 22nd 1949. (tracks 9 to 12) J.J. Johnson (trombone) Gunther Schuller (French horn) Bill Barber (tuba) Lee Konitz (alto sax) Gerry Mulligan ( baritone sax) John Lewis (piano) Al McKibbon (bass) Max Roach drums with Kenny Hagood ( vocal on `Darn That Dream` only) Recorded New York, March 9th, 1950. (tracks 13 to 23) Mike Zwerin (trombone) Junior Collins ( French horn) Bill Barber ( tuba) Lee Konitz (alto sax) Gerry Milligan (baritone sax) John Lewis (piano) Al McKibbon (bass) Max Roach (drums) Kenny Hagood (vocals on `Why Do I Love You` and `Darn That Dream`. Taken from radio broadcasts recorded at The Royal Roost, New York, September 4th and 18th 1948. Expert opinion has it that these highly celebrated sessions were created as a re-action against the febrile complexity of be-bop. This may be put down to a comment attributed to Miles Davis in which he is supposed to have said that whilst be-bop was clever it didn’t serve very well as a soundtrack to a romantic encounter. In fact Miles was never a thoroughgoing be- bopper notwithstanding his stint with Charlie Parker in the late forties and earlier fifties; his legato style contrasted neatly with Parker’s torrid virtuosity but never sought to emulate the athleticism of Gillespie. His giving birth to the cool was in fact happening whilst he was still playing with Parker’s All-Stars, as a glance at his discography will reveal , so he didn’t labour too hard to make the transition. The studio tracks that appear on this re-issue were recorded for Capitol Records and with the exception of the vocal, `Darn That Dream` originally appeared on 78s eventually being re-issued on LP in 1957 under the title for which they have become famous. Like all new developments the cool sound was a synthesis of backward glances and forward looking aspirations and the concept enshrined in these tracks was heavily in debt to the Claude Thornhill Orchestra of the mid forties that featured some novel instrumentation featuring French horns and unison reeds to achieve a subtlety of sound that was clearly a precursor of the formula applied in these recordings. Amongst the architects of that sound were Gil Evans, whom Thornhill employed to write jazz arrangements of popular classics, and Gerry Mulligan, both of whom were key figures in the Birth of the Cool project and can claim as much credit for its realisation as the leader. Other Thornhill alumni also play a part, notably Lee Konitz and Sandy Siegelstein, in re-creating the Thornhill sound which when applied to the boppish themes that make up the programme and are articulated by a smaller ensemble, sound excitingly different and have lost none their appeal with the passage of time though it should be said that the music was initially more of an artistic than popular success. Essentially this is music in which the solo and ensemble passages are closely integrated to produce a continuous interwoven flow with just a hint of dissonance here and there , the emphasis on floating, harmonies and tonal colour being most perfectly exemplified in the beautiful ballad `Moondreams` , a piece of exquisite impressionism. Even the up-tempo numbers like Denzil Best’s `Move` and Powell’s `Budo` are suave and relatively mellow ,the dislocated rhythmic aggressiveness of bop being groomed and smoothed . Of the solos, those of Miles are the most prominent but Mulligan and Konitz make a good showing with the emphasis on lyricism being the most powerful common denominator. The hand of Gil Evans is everywhere and the sessions anticipate the orchestral suites he would create for Miles in the following decade. 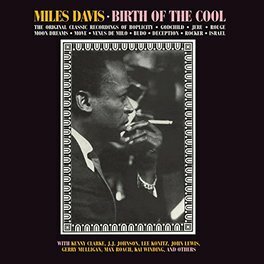 Like the earlier CD manifestation issued under the Capitol imprint as `The Complete Birth of the Cool` this disc includes the live radio broadcast sessions from the Royal Roost Club which pre –date the studio sessions and provide a fascinating glimpse of a work in its preparatory phase. The ensembles are looser and lack the precision of the later music, whilst the solos are longer and don’t strictly adhere to the cool concept that was eventually applied with greater discipline and focus.